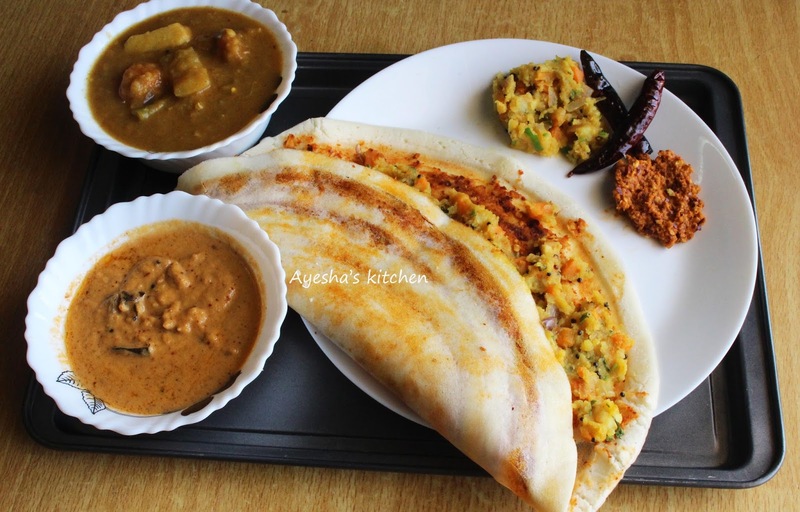 Dosa, one of the typical South Indian breakfast recipe which has universal appeal. We can see lots of Dosa lovers around the world. It is the most demanded and loved dish among South Indian cuisine. As it is healthy, tasty and comfort for stomach, foodies loved this South Indian crepes.We have lots and lots of varieties in dosa recipe. You can check my blog regarding the same. I had posted some of those variety dosas like carrot dosa, Adai recipe, Ghee roast / sada dosa, masala dosa recipe, Rava dosa recipe, Thattil kutti dosa, Neer dosa and like so. All time my favorite dosa is Masala dosa though it is time consuming. You know, the popularity of masala is beyond expectations. The main difference i had found in Masala dosa and Mysore masala dosa is the red chutney spread. Here the dosa is layered with red chutney, butter and then the potato filling. 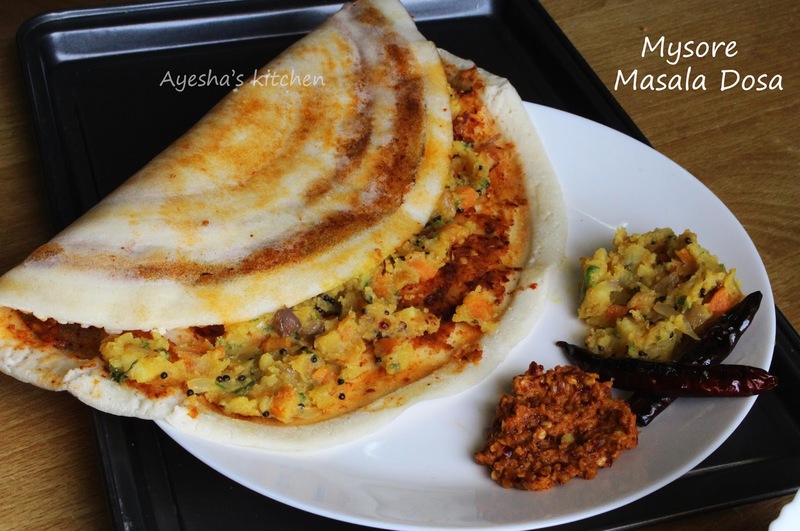 As it is originated from Mysore, it is named as Mysore masala dosa. For all dosa lovers, you must try this variation for sure. In my opinion, we can make more varieties in dosa. Each one will taste different but delicious. All you need is a perfect dosa batter. So keep on trying something new and creative dosa recipes by following a perfect dosa batter. Next day take the batter and mix well. Add water (may be half cup) required for making a batter of thick pouring consistency. Wash and cut the potatoes into half and pressure for 2 whistles with required water and salt. I just boiled it in a pot. Once it is done and cools, peel its skin and mash it (not to a paste). Set aside. Heat oil in a pan and splutter mustard seeds. To this, add bengal gram, urad dal and saute for a while. Now add, thinly sliced onion, chopped carrot and green chilies (i skip this). Saute until onion turns soft. Add salt and now add the mashed potato along with hing and turmeric powder. Combine very well. Heat oil in a pan and roast chana dal, red chilies over a medium flame. To this, add shallots and garlic. Fry for few minutes. Transfer it to a bowl and once cooled coarse grind it. You can add more dried red chilies for more hotness. You can also skip adding grated coconut, but i prefer adding grated coconut as it adds more taste. Once the flame is medium low, pour a ladle full of batter and then quickly spread it evenly in a circular motion from center to outside with the back of that ladle. Once the dosa is half cooked, spread a tablespoon of red chutney over the dosa. Now add butter or sprinkle ghee over it, if required. Add 3 tbsp of potato masala and fold the dosa or roll the dosa. No need of flipping the prepared dosa.